Bellydancing for fitness, fun and fabulousness! Reach for the stars and follow your bellydance dreams! Free gift for the first full-term student signing up to new classes! Termly student prize draw to win a £5 voucher! Introduce a friend and we reward you with a £5 voucher! Have you always wanted to try bellydancing and want a friendly learning environment? Do you want to increase your fitness whilst having fun and enjoy great social occasions? Are you a bellydance fan looking for a new challenge and more student performance opportunities to skyrocket your learning and technique? See what you can achieve with our student success stories and testimonials. Click here to watch our stunning student performances. Want a fab FREE on-line 10mins bellydance workout, fun FREE tutorials, irresistible events, star interviews and MORE bellydancing goodness? Find the nearest venue for you! Interested in a Windsor or Wokingham Beginner Bellydance Class? Email to join our list and we’ll launch lessons as soon as we hit target! Emeralds of the Orient – Open Level - Windsor for improvers, intermediate & advanced students – Last Day for early bird discount: 03 April 2019. Ready for some hot and stylish hip work? Want to add lots of Latin flavour to your bellydancing? Up for some funky footwork? Elevate your fitness levels each week as we bellysalsa to top salsa tunes! Enjoy a weekly workout to suit you, with cardio options and get ready to party! Expert teacher Ellen will take you on a heartwarming spicy salsa journey. Explore irresistible salsa technique that fuses perfectly with bellydance fabulousness! You’ll learn a bellysalsa choreography to optionally perform at your Summer Spectacular Student Show 2019. Wear optional heels you can comfortably dance in for that authentic salsa experience! Bonus Choreography: learn our whole-school Bellydance Boogie to Gypsy by Shakira and optionally perform it at your Summer Spectacular Show 2019 and other forthcoming events. Level - Open Level – Improvers, Intermediates and Advanced. You have completed a beginner course with us or another teacher, or have 3-6 months minimum experience. Course dates - Mondays – 29 April to 08 July 2019 (9-week course.) No lessons 8-22 April 2019 for Easter Holidays. No lessons 6 & 27 May for Bank Holidays. Venue - Windsor Youth and Community Centre Dance Studio 1st floor, Windsor Youth and Community Centre, Alma Road, Windsor SL4 3HD. Mirrored dance studio. Price - EARLY BIRD DISCOUNT: £72.00 for 9-weeks early bird offer. £81.00 thereafter. £8.00 for trial lesson. To secure your place please pay fees on or before the first class of term. Classes are non-refundable and non-transferable, regardless of student’s circumstances e.g. holiday, pregnancy or illness, and weather conditions. By registering you participate at your own risk taking full responsibility for your health and safety. By registering you confirm you are safe, healthy and fit to dance. By registering you consent for all photos and videos taken of you in activities relating to the Rachel Bennett School of Bellydance to be used in all publicity purposes. By registering you accept that, upon occasion, your lesson or part of it may be taught by a cover teacher or teacher trainee, approved by RBSB. By registering you will automatically be subscribed to our monthly newsletter, from which you may unsubscribe or manage your preferences anytime. Access - Plenty of free on-site parking; close to town centre, bus stops and Windsor and Eton Central train station. Please contact Rachel for entry access code & parking instructions. We recommend you wear clothes that are comfortable to exercise in; you don't have to show your tummy and for your feet we suggest soft flat (dance) shoes/ trainers & bring a drink. You might also like to wear a scarf around your hips to help you enjoy the dance moves. Bonus gift - all students will receive our dance toolkit to support your practice and bellydance development. Enrolment by invitation only. Please contact Rachel to express your interest. Last day for early bird deal: 03 Apr 2019. Are you ready to bellydance in a new ultra-feminine way? Want to float across the dance floor with a dreamy veil headdress? Fancy further refining your technique to express inspiring music that’s just as beautiful as you? Realise the ultimate Arabian Nights Fantasy as we explore a NEW fusion style and choreography, created by Rachel expressly for her students. Inspired by Ozgen’s Chiftitelli Court Dance workshop, Rachel will encourage you to glide and dance with an exquisite emotional connection to “Darigh Nur” by Mario Kirlis to be optionally performed at Summer Spectacular Student Show. Be part of a new fantasy bellydance adventure! Students will need to bring a veil attached to a hair comb, hair band or hair clips to wear as a headdress. Theme to be announced and we know you’ll love it! Course dates - Tuesdays – 23 April to 09 July 2019 (11-week course.) No lesson 28 May for Half Term Break. Venue - Woodlands Park Village Centre (Sports Hall), Manifold Way, Waltham Road, Maidenhead, SL6 3GW. Price - EARLY BIRD DISCOUNT: £88.00 for 11-week term. £97.00 thereafter. £8.00 for trial lesson. To secure your place please pay fees on or before the first class of term. Classes are non-refundable and non-transferable, regardless of student’s circumstances e.g. holiday, pregnancy or illness, and weather conditions. By registering you participate at your own risk taking full responsibility for your health and safety. By registering you confirm you are safe, healthy and fit to dance. By registering you consent for all photos and videos taken of you in activities relating to the Rachel Bennett School of Bellydance to be used in all publicity purposes. By registering you accept that, upon occasion, your lesson or part of it may be taught by a cover teacher or teacher trainee, approved by RBSB. By registering you will automatically be subscribed to our monthly newsletter, from which you may unsubscribe or manage your preferences anytime. Crystals of the Orient – Beginners & Improvers – Maidenhead - Last day for early bird deal: 03 Apr 2019. Are you a beautiful beginner wanting to learn the art of bellydance? Are you a gorgeous improver looking to take the next step on your luscious bellydance journey? Beginners will learn essential bellydance moves to create a foundation for this beautiful art form. Improvers will refine their technique, performance skills and skyrocket their bellydancing to the next level with more complex moves and layers. Are you ready for to get ultra dynamic? Want your body to rock out the bellydance beat? Do you love sassy hips and sparkling shimmies? Then come on down and learn the art of the drum solo with us! Audiences around the world love amazing drum solos; they're the much-anticipated show finale and are best to impress. Curious about what to expect? See Rachel's drum solo here and another one here. Ellen will teach you a dynamic dance to one of her favourite drum pieces. Together we'll rock the casbah and you'll have the opportunity to perform your drum dance at our Summer Spectacular Student Show. Ready to take a leap? Enjoy great value with our full-term course special early bird discount. We also offer half-term enrolments. Use the PayPal drop-down box on the right to select your perfect registration option. Just want to give it a try before you commit? 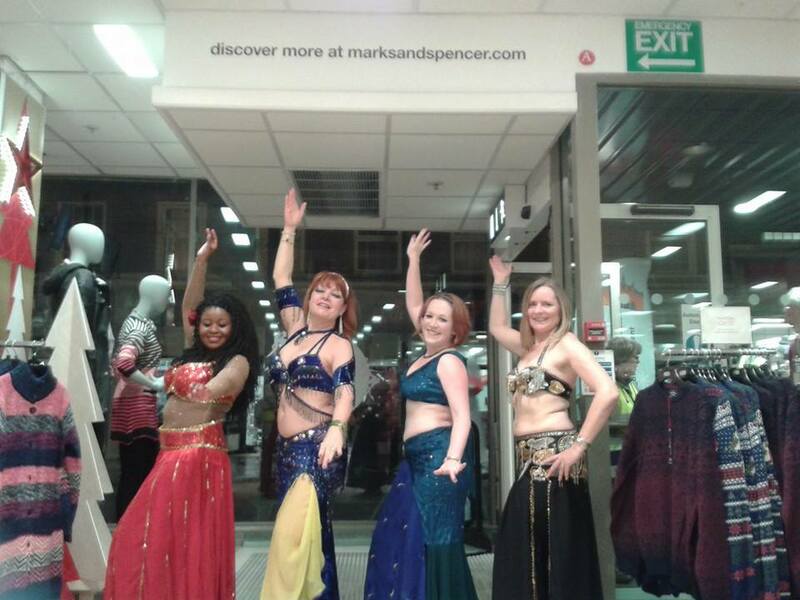 We welcome new bellydancers for a one-off trial lesson too. Keen to sparkle and shine? See what our beginners have achieved in our YouTube clip - above. Course dates -Tuesdays – 23 April to 09 July 2019 (11-week course.) No lesson 28 May for Half Term Break. 23 April to 4 June (1st 6-week half-term) then 11 June to 09 July (2nd 5-week half-term). No lesson 28 May for Half Term Break. Parking - Parking in the Town Hall car park just across the road, the entrance is on Park Street Maidenhead SL6 1RF. Free to advantage card holders or £1.50 for the entire evening if you live outside the borough. Limited free on street parking on York Road, St Ives Road and further along Bridge Avenue. Price - NEW STUDENT & RETURNING STUDENT EARLY BIRD DISCOUNT: £88.00 for 11 weeks. £97.00 thereafter for returning students only. SPECIAL OFFER: £54.00 for a 6-week half-term. SPECIAL OFFER: £54.00 for a 6-week half-term. Valid for either the first or second 6 weeks of a half-term only; non-transferable to another half-term or term. £8.00 for trial lesson. To secure your place please pay fees on or before the first class of term. Classes are non-refundable and non-transferable, regardless of student’s circumstances e.g. holiday, pregnancy or illness, and weather conditions. By registering you participate at your own risk taking full responsibility for your health and safety. By registering you confirm you are safe, healthy and fit to dance. By registering you consent for all photos and videos taken of you in activities relating to the Rachel Bennett School of Bellydance to be used in all publicity purposes. By registering you accept that, upon occasion, your lesson or part of it may be taught by a cover teacher or teacher trainee, approved by RBSB. By registering you will automatically be subscribed to our monthly newsletter, from which you may unsubscribe or manage your preferences anytime. We recommend you wear clothes that are comfortable to exercise in; you don't have to show your tummy and for your feet we suggest soft flat (dance) shoes/ trainers/ socks & bring a drink. You might also like to wear a scarf around your hips to help you enjoy the dance moves. Angels of the Orient - Advanced - Wokingham - Last day for early bird deal: 03 Apr 2019. Enrolment by invitation only. Please contact Rachel to express your interest. Are you ready to expand your dance horizons with beautiful exotic moves? Need a new challenge that will spice up your drum solos and up your fitness levels? Would you like to tell a story through dance with powerful fluid hand gestures? Want to learn a very different dance to perform at Summer Spectacular 2019? Join us and learn Rachel's unique fusion style of bellydance with Hawaiian Hula and Polynesian Dance elements. Venue - Wokingham Methodist Church Hall (Bradbury Centre), Rose Street, Wokingham RG40 1XS. Venue has ceiling fans to keep you cool whilst dancing. Price - EARLY BIRD DISCOUNT: £88.00 for 11-weeks. £97.00 thereafter. £8.00 for trial lesson. To secure your place please pay fees on or before the first class of term. Classes are non-refundable and non-transferable, regardless of student’s circumstances e.g. holiday, pregnancy or illness, and weather conditions. By registering you participate at your own risk taking full responsibility for your health and safety. By registering you confirm you are safe, healthy and fit to dance. By registering you consent for all photos and videos taken of you in activities relating to the Rachel Bennett School of Bellydance to be used in all publicity purposes. By registering you accept that, upon occasion, your lesson or part of it may be taught by a cover teacher or teacher trainee, approved by RBSB. By registering you will automatically be subscribed to our monthly newsletter, from which you may unsubscribe or manage your preferences anytime. Access - Car park located behind venue, off Rose Street – free parking after 6pm. Limited free on-road parking. Waitrose free car park up to 9pm is a short distance on foot. Genies of the Orient – Open Level – Wokingham for improver and intermediate and advanced students - Last day for early bird deal: 03 Apr 2019. Are you ready for some bellydance dynamite? Then come on down and learn the art of the drum solo with us! Audiences around the world love amazing drum solos; they're the much-anticipated show finale and are best to impress. Never seen one before? See Rachel's drum solo here and another one here. Rachel will teach you a dynamic dance to one of her favourite drum pieces. Together we'll rock the casbah and you'll have the opportunity to perform it at our Summer Spectacular Student Show. Level - Improvers, Intermediates and Advanced – you have completed a beginner course with us or another teacher. You have at least 6-12 weeks bellydance experience. Access - Car park located behind venue, off Rose Street – free parking after 6pm. Limited free on-road parking. Bonus gift - everyone enrolled will receive our student dance toolkit to support your practice and bellydance development. By registering you will automatically be subscribed to our monthly newsletter, from which you may unsubscribe or manage your preferences anytime. Do you want to achieve remarkable bellydance results in record time? Looking for solutions to your bellydance challenges? Do you want bespoke bellydance lessons, courses and learning opportunities following a careful needs-analysis? Are you an individual or small group looking for specialist attention from an experienced teacher and professional performer who wants to skyrocket you to the next level and beyond? Would you like to choose the content of every bellydance class, so you learn precisely what interests and motivates you every time and at your own pace? 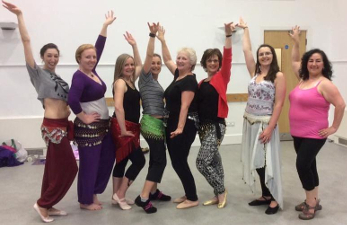 Private tuition for complete beginners to advanced students is offered by Rachel covering a broad range of Egyptian bellydance styles, music and technique. From dancing with props and writing your own dances to learning choreography and perfecting your poise, Rachel will be delighted to support you with one-to-one coaching or group workshops. Students come away from each lesson with their own essential toolkit to support their on-going independent study. This is your irresistible learning opportunity and we can't wait to create an enticing learning programme to celebrate your individual requirements. See what you can achieve by reading my student success stories and testimonials. Dancing the Rhythms - get into the beat! Golden Glories - classical to renaissance Egyptian style - bellydance like a movie star! Rachel welcomes you for tuition at select weekday and weekend dates. 2 hours tuition - £80.00. This package may be split into two lessons of one hour each, if required. 6 hours tuition - £225.00 - This may be split into increments of 1, 1 and a half or 2 hours tuition segments, as required, and must be enjoyed within 8 months of purchase. 10 hours tuition + Bonus Gift worth £40.00: receive 1 extra hour’s tuition absolutely free - £400.00. The 10 hours may be split into increments of 1 or 2 hours tuition segments, as required, and must be enjoyed within 12 months of purchase. Packages must be purchased in full, in advance of your tuition slot and used by the relevant deadline, as detailed above. Classes cancelled with less than 48 hours' notice are non-refundable and non-transferrable, regardless of student circumstances e.g. holiday, pregnancy or illness, and weather conditions. Please kindly note packages may not be paid in partial payments. Additional students may be added to tuition packages with prices upon request. By registering you participate at your own risk taking full responsibility for your health and safety. By registering you confirm you are safe, healthy and fit to dance. By registering you consent for all photos and videos taken of you in activities relating to the Rachel Bennett School of Bellydance to be used in all publicity purposes. By registering you will automatically be subscribed to our monthly newsletter, from which you may unsubscribe or manage your preferences anytime. 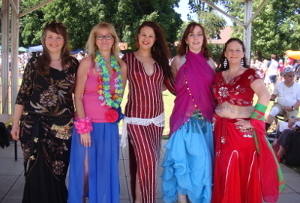 Do you want to be a fabulous bellydance teacher whose lessons are utterly irresistible? Interested in top teaching techniques to inspire your students so they become your loyal raving fans? Setting up your own bellydance school? Want to learn how? Not sure where to start? Need appealing strategies that really work to strengthen your dance school business? Rachel develops bellydancers to prepare them for teaching and establishing their own dance school. Click here for inspiring testimonials. Ready to take on your first professional performance engagement? Want the secrets for success when performing at restaurants, weddings and parties? 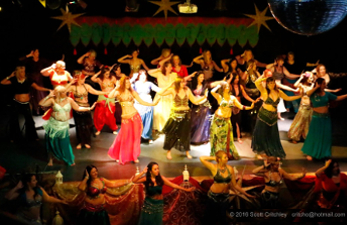 Would you like to position yourself as a priority choice in bellydance entertainment? Rachel develops bellydancers to prepare them for every aspect of professional performance work. Click here for inspiring testimonials. Rachel is a fully qualified teacher with over 15 years' experience instructing adults, teens and children. She has taught and performed extensively in the UK and abroad as a professional bellydancer since 2008, undertaking TV work, restaurant residencies, corporate events, parties, weddings and theatre shows. Mentor you with her A-Z guide on how to set up and run your bellydance school. Teach you how to effectively plan & deliver dynamic bellydance lessons in her teacher training course. Guide and prepare you to attain and enjoy pro-performance engagements where it's your turn to sparkle and shine. Rachel welcomes you for teacher training, bellydance business school and professional performer development on select dates. Sessions cancelled with less than 48 hours' notice are non-refundable regardless of student circumstances.